Welcome to Travel Tuesday! We sure hope you are ready, wands and hats all packed for a great adventure. We're going to be taking you on a written adventure to some of the greatest Harry Potter Attractions around the world! First off? Singapore and it's incredible Harry Potter themed Café! Welcome to a new series- Travel Tuesday. This Tuesday blog will be updating you of the best places to visit to fufill your Harry Potter dreams. If you can't travel there yourself, we will be bringing the highlights of that place to your doorstep every Travel Tuesday! 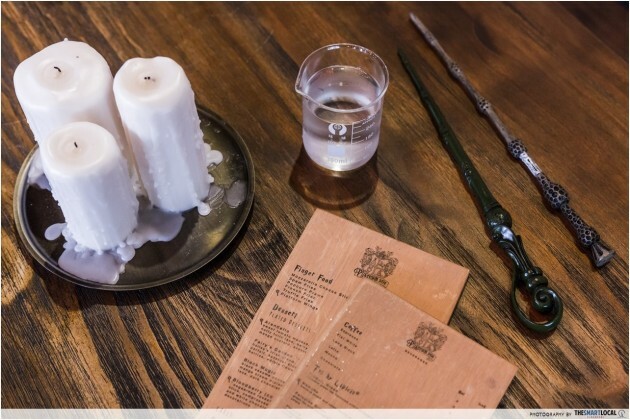 This week we will be taking you to Singapore to the newly opened Harry Potter themed Café- Platform 1094! Platform 1094 is a newly opened Café which serves a range of muggle and also magical-themed food. In this blog I will highlight the best areas of the Café for you to feast your eyes on. There are many reviews on the muggle web of first hand visits to this Café which will interest many of you! Now, onto the main part of this review. What makes this Cafe so Magical? First off, we'll have to start with interior. The Café is complete with delicate decorations and stag-designed seats linking to the main protagonist's, Harry Potter, potronus. It's a fairly warm place with a homely, magical setting. After discovering the interior, you are seated at a table decorated with an even more magical purpose. 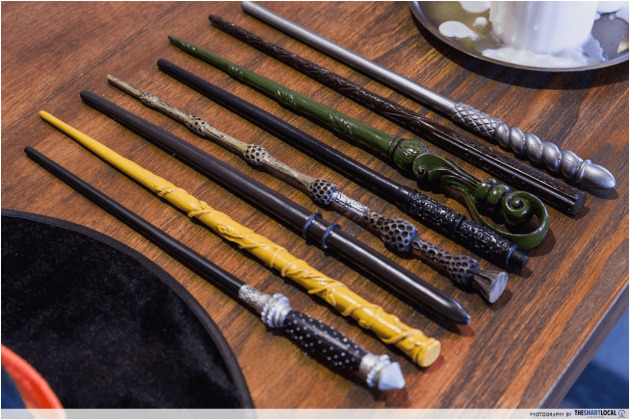 Each aspiring Wizard and Witch to sit in the café is offered the choice of several wands and a witches hat. These props are supplied for some magical photography which you will treasure for years. Below is your choice of trusty wand, including some you may recognise *wink*. Above: Your delicate choice of woodcraft wands. How the elder wand ended up in a muggle Harry Potter fanatics Café, we will probably never know. Please do not try to steal the wand, it probably belongs to the café owner and the magic will rebound on your pour spells. No one wants their nose to turn into a cactus! The Café's utensils are rather potions based, with beakers for cups and special conical flasks for mysteriously made cocktails (all none-alcoholic). The candels, at request, will be lit to supply a rather Hogwarts themed look to your meal. The tabels cheerfully resemble the wood you may find in our Great Hall here at school- just like home! Don't worry about getting sick from drinking out of these beakers. As far as we know, they're not used for potion making. Above: A classic table set at Platform 1094 with menus. Above- a potions inspired herbal tea with modified beaker and testube, allowing for a brew of absolute delites. There is also the offer of none alcoholic cocktails which are served in custom conical flasks to the drinker. The below drink is created with Tonic water, lime and cherry- we hear it's delicious. Right- A conical flask containing a cocktail which can be found at Platform 1094. However, the drinks aren't their only attraction. Platform 1094 sells what can only be looked at as fantastic food. What intrigued me the most when writing this article happened to be the magical deserts they create. Platform 1094 has a range of cupcakes, decorated differently on wether the person identifies as a wizard or witch. They are esquisitly detailed and beautifully designed. However, the highlight of their deserts are the plated, decorative treats which a witch or wizard can order. Black Magic has a forest like opinion as shown below and is decorated in a dark, mysterious way. There is also the option of a wand-decorate chocolate delight. We are coming to the end of this Travel Tuesday article. I hope I've been able to take you on a magical adventure to Singapore and back, showing off the best this Harry Potter themed Café has created. However, before you all close off this page- I have one final treat for you. Yes, that's right- Platform 1094 has a beverage which they quote as being like the Goblet of Fire. The magic themed drink/dessert produces sparks of flames when the top is lit- and it is truly spectacular! Unfortunately, you won't see your name flying out this Tri-Wizard tourmanent. But you will be seeing a bit of muggle-made magic. Don't believe me, here's an awesome picture of the prized creation- "The Goblet of Fire"
I'll leave up to you to ponder over how the muggles achieve this *winks*. That's all for this weeks Travel Tuesday! The next adventure in this series will bring you to England. One of our team has visited the Harry Potter Studios and they have a fun-filled review for you.